Gagasi FM is the number one commercial radio station in KwaZulu Natal to reach the black urban and peri-urban black youth. The station harnesses a strong local identity and embraces KZN's urban and peri-urban black youth market by boradcasting in Zunglish - a combination of English and isiZulu. Gagasi FM strives to remain relevant and keeps in touch with what matters most to its listeners, meeting their information and educational needs through specialist features, focused events and promotions. Content includes dedicated lifestyle features and specialist slots such as news, sports, traffic reports, competitions and on-air features. 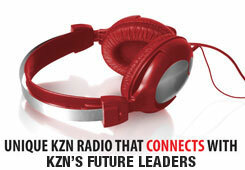 The station boasts lively and talented on-air presenters who are passionate about what they do. As a young, hip, fresh, trendy and youthful station, Gagasi FM is music driven. The music format offers a diverse mix of R&B, Durban Kwaito, Afro House, Afro Pop, Hip Hop and Classic Soul which is carefully selected for popularity.